While he may not have beaten much, the high-profile Dynasty colt Horizon put together a convincing performance and booked his ticket into the Investec Cape Derby G1 when winning the R250 000 Gr3 Politician Stakes at Kenilworth on Saturday. Trying the 1800m for the first time, the handsome colt rose to the occasion and suggested that the 2000m of the Derby in three weeks time would be well within his range. The one-time sale record-breaker yearling has been a natural pressure horse from day one and nobody was better placed to sum up the Bass-Robinson camp sentiment after the Derby trial than the man who started the business over 40 years ago. “It isn’t easy you know. He cost money and was a small yearling. But he looks to have gone the way we thought he might go. In fact he has the look of a stallion about him. And now that he is winning, he looks to be on his way,” said the conservative and highly respected Mike Bass – a man whose eye for picking yearlings has been proven on the racetrack for decades. 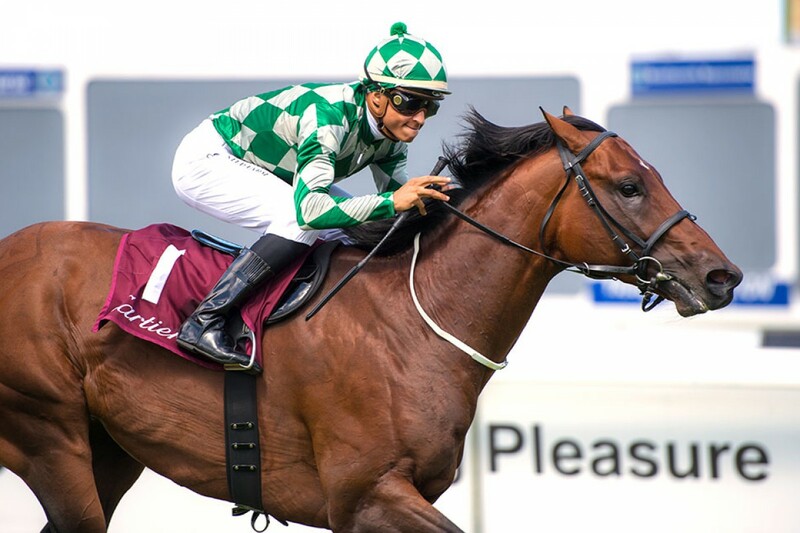 Horizon races in the dark green and khaki of new owners Piet and Vivia du Toit, who tasted success on day one of the LQP Festival, when their 3yo Live Life won the Gr2 Sceptre Stakes. After the Jet Master Stakes debacle of his previous run, jockey Grant van Niekerk made no mistakes on Saturday, with Horizon cruising home by 1,25 lengths to beat Gr3 Langerman placer Newlands in a time of 113,07 secs. Bred by Maine Chance Farms, Horizon, originally named Shining Knight, made the headlines when he smashed the South African auction record when knocked down to Mike Bass for R5.2 million at the CTS Cape Premier Yearling Sale in January 2015. By SA Horse Of The Year Dynasty, Horizon is out of a full-sister to champion sire Silvano. The very progressive looking Horizon has won 2 races with 2 places from 5 starts for stakes of R241 025. He was the second feature winner and third success for the yard over the two day festival.